In 1569 during the rise of the Dutch republic, an Anabaptist named Dirk Willems was being held in jail because of his association with an unapproved religious group. He was able to escape from his captors but the guard closely pursued him across a frozen pond. It was late in the winter, and the ice had thinned, making it unsafe. Fortunately Willems was able to make it across the lake in safety. But the guard was not so fortunate, and the ice gave way beneath him, plunging the pursuer into the icy water. There was no one to save the guard except the man he was pursuing. 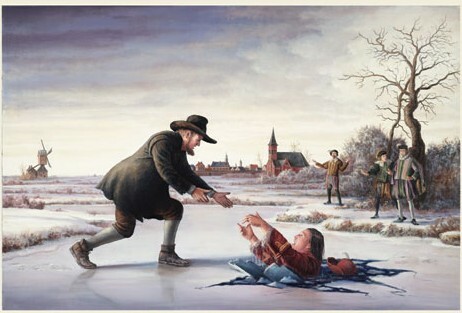 Because of Willems’ integrity and values he heeded the cries of the guard and returned to the dangerous ice where he extended his hand to his pursuer. Dirk Willems saved his pursuer at great risk to his own safety, not only from the ice but also from the ruling authorities. The guard arrested the fugitive and returned him to jail. On May 16, 1569 authorities tortured Willems and burned him at the stake. The Dutch authorities slept well that night. Dirk Willems was, in their minds, a heretic. He was a threat to their faith. He was dangerous because he didn’t agree with the religious establishment. That night hardness silenced grace. Judgment silenced forgiveness. Death silenced life. The authorities felt justified by their actions, and believed they were demonstrating fairness and justice in the killing of Dirk Willems. They believed that people like Willems deserved to die. Until he wished he had just turned his back and let the man go. But he would have had to turn loose of the pride and arrogance that insulated his decision.